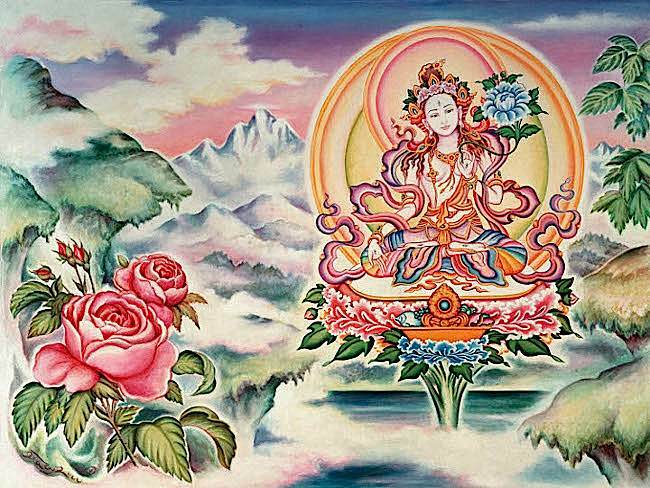 Is White Tara the Same as Tara? White Tara is as much the “swift heroine” as Green Tara—since they’re both aspects of Tara, who is known as the “swift savior.” Although I practice many types of self-healing—and also healing for others, now that my parents and friends are aging—I’ve found Sita Tara is the fastest to bring “first aid” as well as the most effective for long-term health. I do, personally, work with several effective healing Buddhist practices and deities—including the most wonderful Medicine Buddha Bhaisajyagururaja—but, if I’m in pain, in need of quick help, or feel my very life is threatened by illness, White Tara is my main practice. Why? Because, Tara’s help is immediate, and nearly miraculous in results. [For a guided video meditaiton with H.E. Zasep Rinpoche, see below. For a very short White Tara practice that does not require empowerment see “Simple White Tara Practice” section at the end of this feature]. 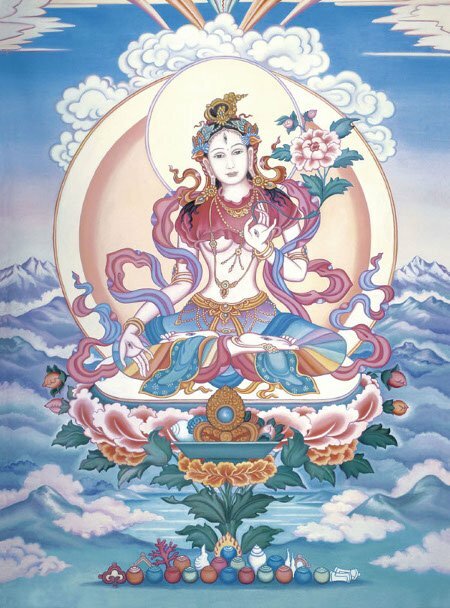 White Tara is particularly effective in Mahayana Buddhism for long life and healing practice.Visually, She is notable for Her seven eyes—four on the palms of Her hands and soles of Her feet, one in Her wisdom eye location, and Her two regular eyes. She is a Female Buddha—an aspect of Arya Tara. Daily, I practice both Medicine Buddha and Tara—both simple practices involving offerings, affirmations and mantras. Regularly, since I have initiation and instruction from my teacher, I also fulfill my commitments for their sadhanas and try to keep my Bodhisattva vows. Sita Tara or White Tara visualization. Tara is white, with one face, two hands, holds uptala flowers and sits on a lotus throne and moon disc. His Eminence Zasep Tulku Rinpoche giving teachings on Medicine Guru to a large audience. Rinpoche also teaches Tara practice for healing. 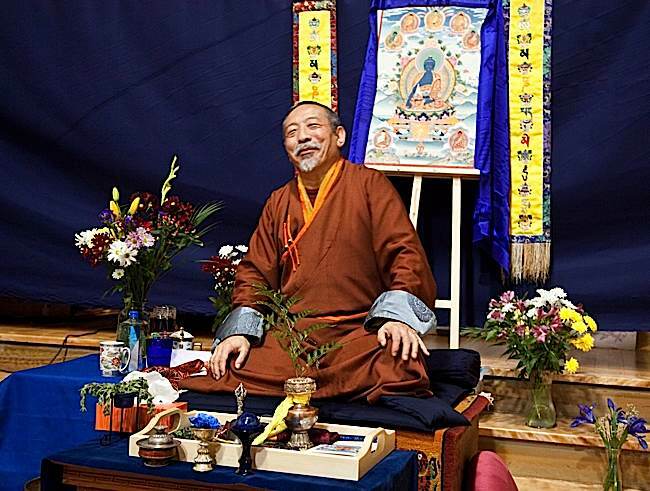 He is spiritual head of many Gelugpa centres in Canada, the United States and Australia. White Tara is an aspect of Tara, a fully Enlightened Buddha. She helps us recover from or prevent illness and helps bring long, healthy life for you or someone you care about. Sita Tara rescues all, and requires no special permissions or initiations to practice at a basic level. Advanced practices, some sadhanas and advanced healing certainly require a teacher’s guidance and permission, but the meditations and practices I’m discussing here are for anyone. Meditating on Sita Tara is a good place to start. 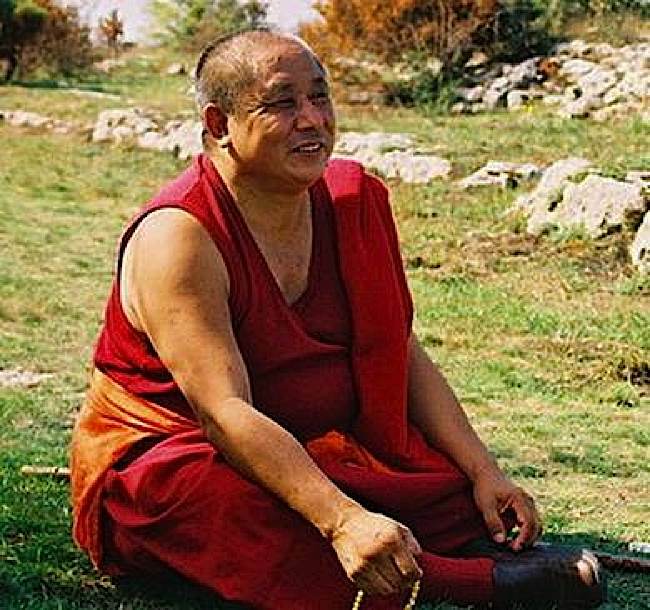 If you have time, take a half hour and meditate along with Gelek Rimpoche of Jewel Heart—a well-known and highly realized teacher of the Gelugpa tradition. Mantra is very effective for protection and healing both. Simply repeating the mantra with focus is enough to bring healing. Visualizing Tara’s blessings entering into your body as purifying light, purging illness and pushing out negativities as black smoke or sludge, is even more affirming, strengthening the blessing. White Tara’s mantra in sanskrit script. Tara’s ten syllable mantra may be visualized surrounding the seed syllable Tam (shown in the centre). Surrounding the Tam, are the Tibetan syllables beginning at the top (Om) then left clockwise. Although Tara mantras can be practiced by anyone—they are more effective when transmitted by a teacher. If you are in need of healing, it would be ideal to seek out a qualified lineage teacher and ask for either lung or initiation. Lung is, broadly speaking, transmission of the mantra itself (or permission to use the mantra), whereas initiation (also known as empowerment) can involve complete deity practice and commitments. 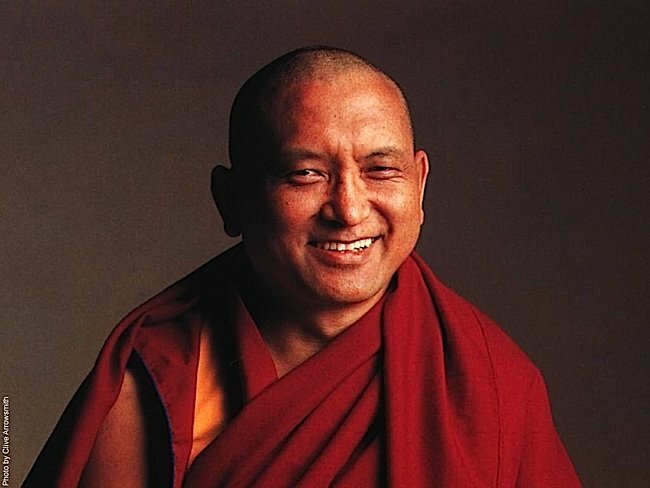 Lama Zopa Rinpoche is a highly realized teacher and spiritual head of FPMT. According to the highly realized teacher Lama Zopa Rinpoche and the FPMT, “empowerment of Tara is needed to practice [Tara’s] sadhana in full. However, one can do this practice without such an empowerment as long as one does not generate oneself as the deity. If one does not have the empowerment, one can do the self-generation practice at the crown of one’s head.” Basically, visualize Tara and meditate on her, and receive blessings from her, but do not absorb or merge with Tara—a more advance practice. With or without empowerment, all mantras carry the blessings of the deity—connecting us with our inner Buddha or Tara (Buddhanature). Mantas are quite powerful in meditation and active healing. If empowerment or lung is impossible, the mantras are less powerful, but still effective. I chanted Tara’s mantra for eight years before a teacher came into my life to guide me and empower my practice of Tara. I believe, in some ways, chanting the mantra for those years created the conditions for me to find my teacher. White Tara visualized here with a white TAM seed syllable at her heart. TAM is the seed syllable of all Taras, who are all Tara. 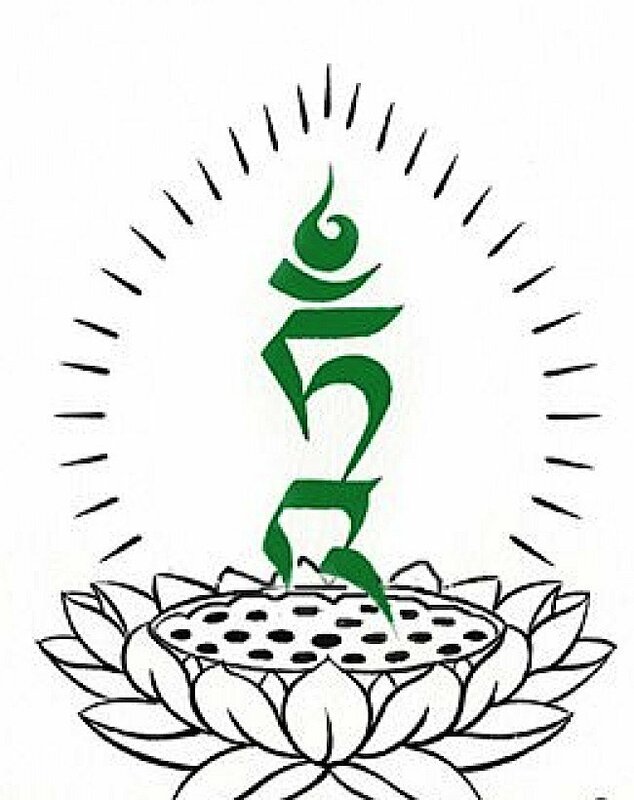 Typically Green Tara is visualized as a green Tam, and White Tara as a white syllable. The seed syllable contains the essence not only of the mantra, but also Tara Herself. White Tara’s mantra in Tibetan Script. Above is an image of the mantra in Sanskrit. 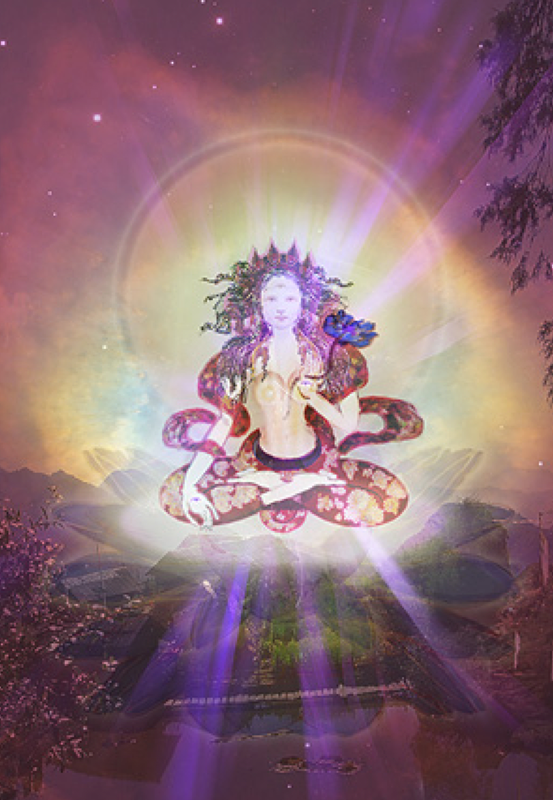 The Tam syllable, seed syllable of Tara, is most often visualized at Her heart, glowing and emanating healing light. TAM normally sits on a lotus. 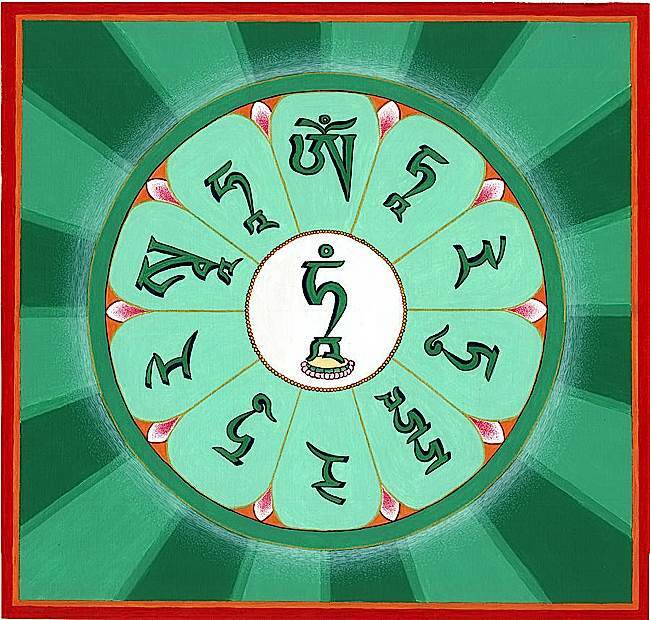 Here the TAM is green, which can represent any Tara. Often White Tara practice visualizes the Tam as white. Here’s one of the most beautiful “chanted” versions. Healing and helping others is something we all should all wish to accomplish. Aside from the selfish goal of increasing our own merit and good karma, we engage our compassion as humans and Buddhists when we think of others. The White Tara mantra can be modified from a “personal” affirmation to one targeted at someone else. “Mama” in the mantra means “mine”, or “I” or “me” meant for self healing. Simply replacing “Mama” with the name of another person sends Tara’s healing power and blessings to someone else. There are also forms of White Tara’s mantra for subduing or pacifying, with somewhat different wording, meant for subjugating fevers, viruses, evil spirits and so on, but those are more advanced practices that should be guided by a teacher. Fevers, evil spirits and viruses are equally subdued by the main White Tara mantra, or even the root mantra of Om Tare Tuttare Ture Svaha. 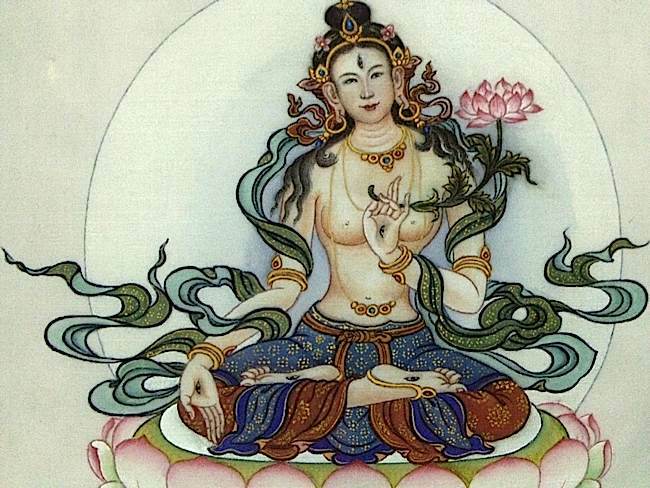 Tibetan medicine often makes use of “mantra-blessed water or medicines.” At a basic level, after performing a twenty or thirty minute mantra recitation-meditation, preferably visualizing Tara, blow on your medicine or a glass of water and visualize the mantra’s “power of Tara’s speech” as light coming from your mouth and being absorbed. Then, consume the medicine. In more intense practices, or when the medicine is for someone else, you can place a week’s supply of medicine on a table or shrine dedicated to Tara with Her Image, some water bowl offerings, perhaps Her mantra written out, and other meaningful objects. Chant the mantra for a week, then use/dispense the blessed medicine. Finally, mantra’s fullest ripening comes from full performance of a sadhana. These are passed down through the centuries by direct transmission of teacher to teacher, right back to the Buddha or Enlightened Being. These normally require a teacher’s transmission, lung or empowerment. Some sadhanas, such as White Tara’s sadhana written by the fifth Great Dalai Lama can be performed by anyone, provided the uninitiated do not generate themselves as the deity. In other words, substitute simple visualization for generation of oneself as Tara. Visualizing White Tara. Important symbolic characterstics include white skin, the appearance of a beautiful young woman seated on a splendid Lotus throne and moon disc. White Tara has seven eyes, two eyes on Her face, plus wisdom eye on Her forehead, and eyes on each hand and foot. 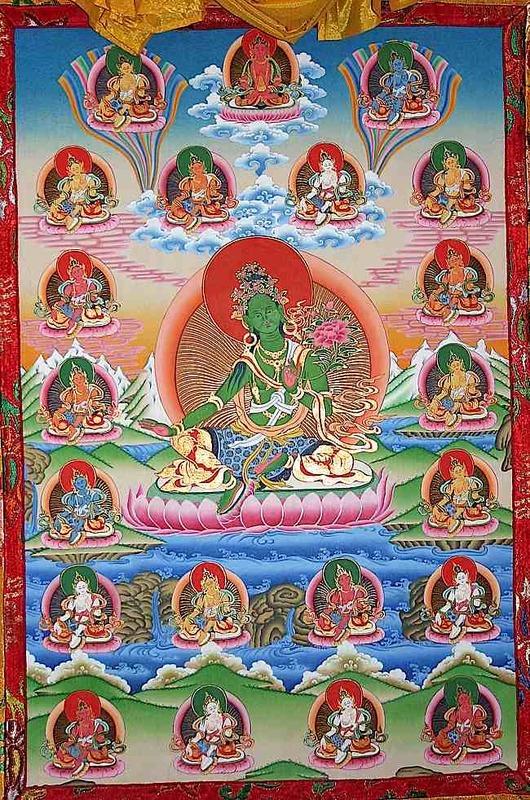 Visualizing Tara is an important part of mantra recitation when possible. Although the mantra can be recited while walking, cooking, etc, when engaging in a highly focused healing practice, sitting with eyes closed (or half closed) in meditation is best. 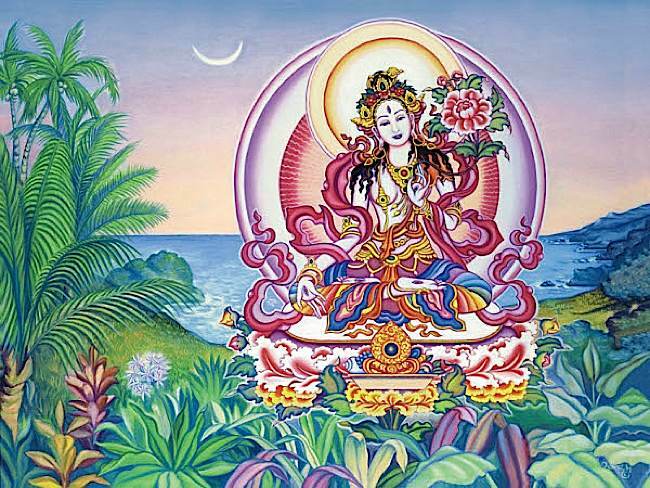 White Tara has Her own mantra, Oṃ Tāre Tuttāre Ture Mama Ayuḥ Punya Jñānā Puṣtiṃ Kuru Svāhā, known to be actively beneficial in the practices of Long Life and Health. This tangkha is correctly visualized. Amitayas, the long life aspect of the Buddha Amitabha, sits as an ornament over her head. When you have a teacher’s guidance—the visualization would be as he or she instructs. There are generation practices associated with some initiations, but none of that should be contemplated without a teacher. For someone without a teacher’s guidance, a basic visualization of Tara in front of you—generally involving healing white light flowing from Tara into you or the person being healed—is simplest. Sometimes you visualize Tara on top of your head, arising from your crown chakra sitting on a lotus throne with 1000 petals. You can make the visualization simple or complex. More complex and detailed visualizations engage the mind to a higher level, and tend to be more effective for that reason. Visualize what you can of the following details. White Tara “body” is visualized as being the nature light. In the same way Tara is visualized uncontaminated and spectacular, we should see Her arrayed in gorgeous silks and shining jewels like stars. Tara, Her name, literally translates as “star.” The beautiful ornaments are not meant to show attachment, but are symbolic of Her transcendence. On the crown of Her head is a crown of five sides representing the five Dhyani Buddhas and on top of Her hair knot is Amitayas Buddha, the Buddha of Long Life. Amitayus is the Long Life emanation of Amitabha. 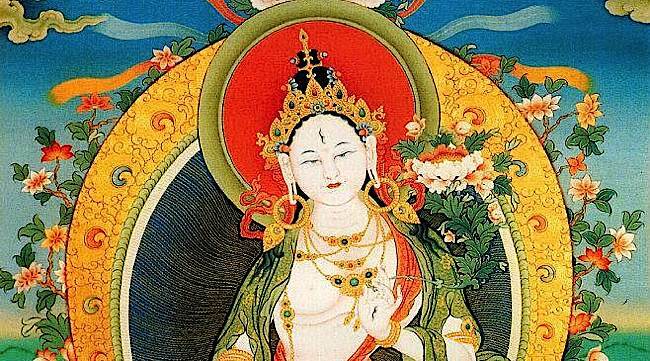 With other Taras we visualize Amitabha as her hair ornament. Amitabha and Amitayus are the same Buddha, different manifestations (similar to Green and White Tara). 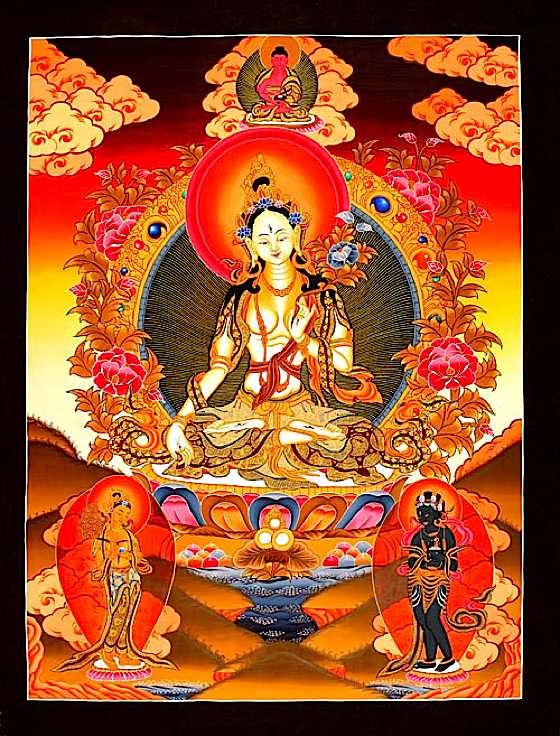 Amitayas and Amitabha are both red in colour. 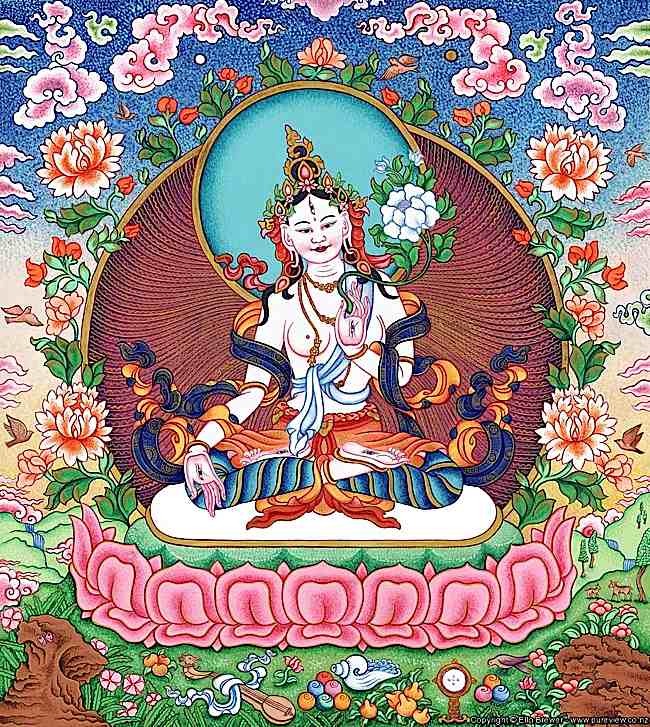 Healing practice with White Tara is enhanced when you visualize as many details of Tara’s appearance as possible. 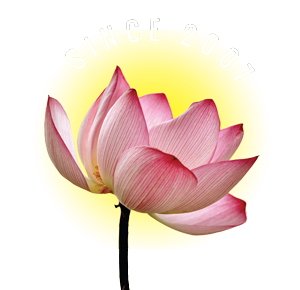 On the lotus is a moon-disc, representing all-important bodhicitta, and the wish to achieve enlightenment. The deity sits on both a lotus and moon-disc, indicating Tara has achieved enlightenment through renunciation and bodhicitta. Beautiful Tara Herself has one face, two arms, but—importantly—seven eyes. An eye appears on each of Her hand palms, Her feet and three on Her face (two “regular” eyes and the wisdom eye on the forehead chakra). The eyes represent how the Mother of the Buddhas sees all our suffering. White Tara has seven eyes. Very strikingly, the position of the seven eyes create the shape of the sankrit letter TAM which is Tara’s mantra when you connect the eyes with lines), according to Visible Mantra. Also, they symbolize the special relationship between the five “extra” eyes of White Tara and the five Dhyani Buddhas: Akshobya, Amitabha, Amoghisiddhi, Vairochana and Ratnasambhava. The right hand of Tara is in the “mudra” (hand gesture representing) Supreme Generosity—the mudra that signifies Tara is ready and willing to grant us the state of Enlightenment. The left hand of Tara holds a white lotus flower or uptala. 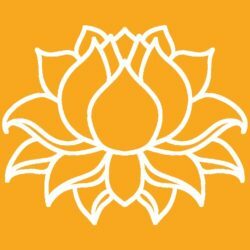 Uptala is really a different flower from the lotus, but most people are content with visualizing a lotus. The uptala stems out in three branches, each with a different flower, one in full bloom, one about to open, one just a bud. These represent the Buddhas of the three times: past, present and future. In advanced visualizations, we’d see a white syllable TAM—Tara’s seed syllable mantra. If you don’t know what that is, it’s best to wait for a teacher. The Tam is normally at her heart. Often, visualizations would—as with other Buddhas—visualize shining seed syllables OM, AH and HUM at her crown, throat and heart respectively. These represent the Holy body (OM), speech (AH) and mind (HUM) of Tara Buddha. You might visualize (imagine) white healing light flowing from Tara into your crown chakra (top of your head) or heart chakra, or all of your chakras. The energy fills you as you chant the mantra, displacing negativities, bad karma, disease and other impurities—often visualized as black smoke or sludge dispelled violently from your body. For advanced practices, your teacher would guide your visualization, but for simple practices, the healing light is a safe, effective image. As a final note, try to imagine Tara as a real, three dimensional being of light, who can move, speak, gesture, transmit—Tara is above all “activity” of the Buddhas and definitely not a static two-dimensional picture. The four immeasurables: This prayer affirms your wishes that all beings not suffer and be happy—important to generate loving kindness and Bodhicitta. Preferably recite the Seven Limbs practice (seven short lines that contain the essence of good practice). Visualize Tara as described above or as indicated by your teacher. Normally you visualize Tara in front of you when you do not have teacher instructions. Recite the mantra (either Tara’s root mantra, or the full White Tara mantra, optionally with the name of the person who is ill replacing “mama” in the mantra. As you recite, visualize white healing light and energy transmitting from Tara to you or the person. In advanced visualizations this might emit from Tara’s heart chakra and absorb into your heart chakra, or as advised by your teacher. Dedicate the merit. (This is generally very important). You can visualize mental offerings if you don’t have bowls of water. Buddhas do not need your offering. You are generating merit by this practice. To You Venerable Tara, with my body, speech and mind, I respectfully prostrate. 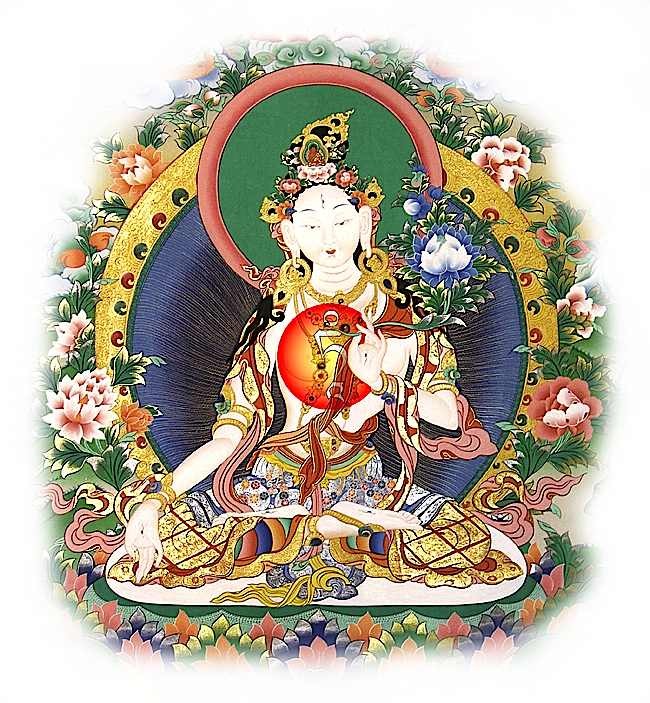 The Colophon: This praise of exalted White Tara, supreme mother of all Buddhas, was written by the monk Gyalwa Gendun Drub while he was residing in the Hermitage of Great Awakening at the Tegchen Potreng. Thank you so much for all of this beautiful information! 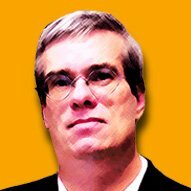 I am grateful to have found this site! 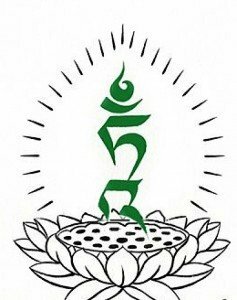 How can I find a white Tara teacher in Los Angeles, California? Please heal my sons David & Zachary. [Nyingma] 75 S. Grand Ave. I personally can’t suggest a particular teacher or centre as I’m not in L.A., but this is a start I hope for you and maybe some readers will jump in with suggestions too. Hi – what do you mean exactly by “do not generate themselves as the deity.”? I understand there is a long mantra and a short version ? Of white tara. Also I want to create a altar dedicated to white Tara. Is there anything specific I need ? If blessing others you’d change MAMA (mine or I) to their name, for example. You can also expand the requests. For instance, after Jnana (wisdom) you could add Karuna (compassion), Virya (vitality and energy). Hello and namaste. I would like to get a tattoo of te White Tara mantra; howvere,we have seen many variations and would appreciatiethe correct Tibetan prayer and aspelling, please. Hi Roscoe, Ouch, a tattoo, better get it right, no corrections, right? Actually, if you’re tattoo-ing a mantra, that’s a good one… long life:-) Problem is you have Sanskrit version, Tibetan version, and then you have Sanskrit letters and Tibetan letters. As English characters, meant for chanting, i.e. transliteration the SANSKRIT transliteration is: Om Tare Tuttare Ture Mama Ayuh Punya Jnana Pustim Kuru Svaha (but some people capitalize the letters, some don’t), but it’s pronounced with some “SH” sounds (Pustim is Pushtim)… so I’d strongly suggest for a Tattoo you consider Sanskrit or Tibetan lettering, not English. It seems more genuine. 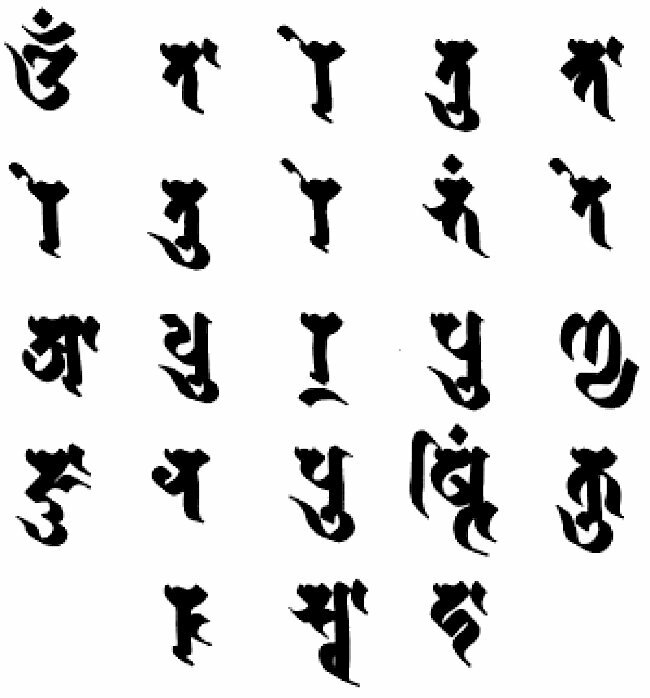 Most Tatts I’ve seen are in Tibetan or Sanskrit characters rather than English. Some people tattoo the Seed syllable and then the rest in English. So it depends on what you’d like. 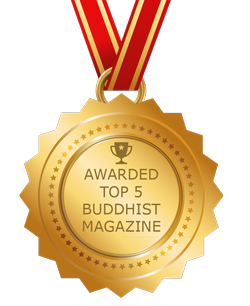 The best authority for getting it right (for all three: Sanskrit, Tibetan and English) would be Visiblemantra.org. The page for White Tara is HERE: http://www.visiblemantra.org/white-tara.html. That site is very reliable. 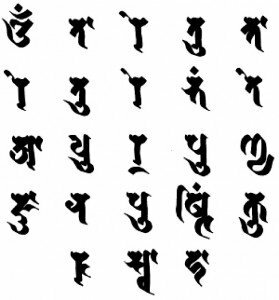 You’ll see they have Tibetan Uchen type version as well as Siddham (Sanskrit) typography there. Thanks for this useful information. I have a picture of white Tara. Where should I place it? What direction should the picture face? As it’s a wall hanging picture, where in the house should I hang it? Like bedroom – master or children’s..
Is there any prayer that I should offer on a daily basis when it’s hung.. Thanks n look forward to your response. Can I request you to send the response to the email pls? 1. Buddhas (Tara is a fully enlightened Buddha) should always be higher than other images of beings (horses, people, etc) and in a central prominent position to give due respect. If you have a shrine, place on or above. If not, the main living room, or an entrance in an attractive, prominent position. Often, it is respectful, if you are a Tibetan Buddhist, to drape a kata (scarf) along the edges of the frame. If it is blessed by a teacher, so much the better. When you hang the picture, say the mantra (see below). 4. Traditionally, when you first see the image (in the morning, coming into the house etc), you would bow your head, perhaps raise your hands in prayer mudra, or do a prostration (depending on your faith) and you would normally say, something like “Namo Buddhaya, Namo Dharmaya, Namo Sangaya” or in English “I take refuge in the Three Jewels: Buddha, Dharma and Sangha”. Or, you could say Tara’s mantra. If you have no White Tara initiation, normally you say OM TARE TUTTARE TURE SOHA (this is fine for everyone) and if you have initiation you can say “OM TARE TUTTARE TURE MAMA AYU PUNYE JNANA PUSHTIM KURU YE SOHA” which is the long life mantra of White Tara. 5. If you drop or damage the picture, always bow, touch it to your head, and say something like OM AH HUM (purifying body speech and mind) or just say “I’m sorry.” Enlightened Buddha images should never be just tossed in the garbage or burned as if they are household waste, even if damaged. Ultimately, just be respectful. In Buddhism, although we know the Enlightened is in all things and Whtie Tara is everywhere, (all beings have Buddha Nature) it is a matter of good karma for you to be respectful of images. I thought the White Tara mantra was “Aum Tare Tuttare Ture Mama Ajur Dschanna Punje Pushting kuru svaha”? There are some variations, and you should always do it — and pronounce — as transmitted by your teacher (i.e. lung or mantra transmission). If you were given in that order, and that pronunciation, that is the way you should do it. In Sanskrit it’s slightly different than in Tibetan. Note ṣ as in is more-or-less pronounced “sh”. Anyway, the only difference in your mantra and the more widely accepted versions is the ORDER of the words. You have Ayuh and Jnana (i.e. in your phonetic spelling Ajur and Dschanna) reversed — but all the syllables are the same, so probably there’s not difference, but ask your teacher. That’s why we have to rely on our Guru. This kind of story is “commentary” or information only, teacher is the guide. Some people were asking about the meaning of the mantra. We have two mantras here. We have the general Tara mantra: om tare tuttare ture soha. The whole word Tara means liberator. That’s what her name means. We have three derivatives of that: om, which refers to the Buddha’s body, speech and mind because it has those three sounds: om, ah, um. That’s the Buddha’s body, speech and mind. Then, tare tuttare ture, so there are three things that we’re liberated from. tare liberates from samsara by removing the afflictive obscurations: the afflictions, their seeds, and the karma that cause rebirth. Tuttare counteracts the eight dangers and I’ll talk about those later. They are eight specific inner afflictions that correspond with eight external dangers. They’re listed in the book How to Free Your Mind: Tara the Liberator. I’ll go over those in the future. Then ture is freeing from all disease. While you’re saying the mantra you’re thinking of being freed from all of those three things. When we’re talking about disease, of course it can be physical disease but the biggest illness is our afflictions. Then soha means: “may this all come about,” or “may this take root.” You can also think about the meaning of the mantra when you’re saying it and feel liberated: from samsara, from the eight dangers, and from all illness. We also have the increasing mantra: om tare tuttare ture mama ayur punye jnana pushtim kuru soha, and that is for increasing our life, our merit, and our wisdom. Om is the same: the Buddha’s body, speech, and mind. Tare is freeing from samsara; tuttare is freeing from the eight dangers; ture is freeing from illness. Mama means myself, so here you’re doing it to increase your own lifespan, merit and wisdom. If you’re doing it for your teacher instead of mama you would say guru: om tare tuttare ture guru ayur punye jnana pushtim kuru soha. I do that for my teachers every day. So you would have mama, meaning yourself; ayur is lifespan; punye is merit; jnana is wisdom; and then pushtim is increase. Again, kuru soha: may this come about. You can think about the meaning of that mantra while you’re saying it. Really feel like your lifespan is increasing. We’re increasing your karmic lifespan and especially removing any kind of karma that would cause untimely death. Also, we’re increasing our merit so that we can have a longer lifespan. They say that death comes about either because: (1) the karmicly given lifespan that was with us when we were born either that has run out or we have an untimely karma that ripens. Or, (2) we run out of merit. Punye is increasing our merit, not just the merit to have a long life, because that’s just this lifetime. The reason we want a long life, by the way, isn’t just because we don’t want to die—it’s because we want to practice the Dharma. Everybody doesn’t want to die, but we should have a better motivation than that: it’s for doing our Dharma practice. So punye means increasing our merit—because to gain realizations we need a lot of merit. You can contemplate that those three are increasing (lifespan, merit, and wisdom). This of course leads you into a contemplation of what else besides saying this mantra can I do so that my lifespan, merit, and wisdom increase. Well, lifespan, okay, take good care of our selves. But how do we increase our merit? We do this through the practice of generosity, keeping good ethical discipline, practicing patience, doing all sorts of different meritorious actions: prostrating, making offerings, and so on. How do we increase our wisdom? By learning the scriptures, thinking about what we’ve learned, reflecting on it, and then meditating on it, as well as putting it into practice in our daily life.